Restoration of saline soil in coastal areas requires detailed understanding of spatial and temporal soil salt distribution and how the distribution is affected by different environmental factors (e.g., precipitation and evaporation), particularly under the influence of salt water intrusion. 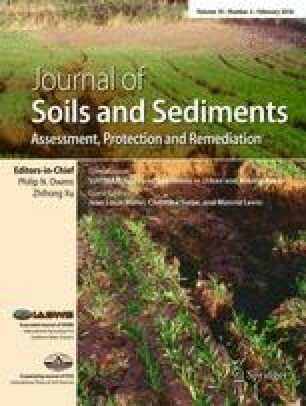 Because of the high accuracy of chloride measurement, and chloride as a common ion in soil salt, we used soil chloride as a proxy of soil salt in a coastal area of southeastern China. The study sites, without confounding influences from human activities and vegetation cover, provide a unique opportunity to estimate the influence of the ocean and climatic factors on soil chloride. Our study represents for the first time the use of daily measured precipitation and evaporation data to quantify these two climatic factors on soil chloride content. Our study includes three sites S1, S2, and S3 which have different distances to the ocean that can indicate the sea intrusion effect. Soil chloride was measured at six soil depths and three times a month from January 2013 to December 2014. We used a general linear model to describe the soil chloride content as a function of distance from the coast, precipitation, evaporation, and soil layer, and the interactions of these factors. We detected significant main factors including distance to ocean, soil layer, precipitation, and evaporation. The closer site to the ocean and deeper soil layer have a higher chloride content. Precipitation has a strong negative effect, particularly in spring and summer, on the soil chloride content, because of its dilution effect. Evaporation has limited effect on the soil chloride content, because its uptaking effect may be offset by precipitation. The sea intrusion influence can result in degraded soil quality, and this influence may be complicated by the combined effect of precipitation and evaporation. We found that soil chloride in a coastal ecosystem may be highly affected by the salt water intrusion according to the site and layer effects in the results. Chloride is highly mobile and soluble which makes soil chloride highly sensitive to the change of sea intrusion, precipitation, and evaporation. This work was supported by a Key Program granted by the National Natural Science Foundation of China (no. 51479063). We thank Jiangsu Province Hydrology and Water Resources Investigation Bureau for providing climate data.